Brian’s Aunt Margaret and Uncle Barry live nearby Deltaville, VA and we were excited to see them during our stopover here. On Wednesday evening, they came to meet us at the Deltaville Marina. We invited them for a boat tour. Unfortunately, Uncle Barry couldn’t risk the dinghy ride for fear of getting his foot wet after a recent surgery. Aunt Margaret did come out to see Rode Trip. She thought Rode Trip was rather cozy. Aunt Margaret and Uncle Barry then took us for a boat tour of their boat Irish Magic, a Catalina. Such a lovely boat! I especially enjoyed the seats in the cockpit that were built into the stern rails. 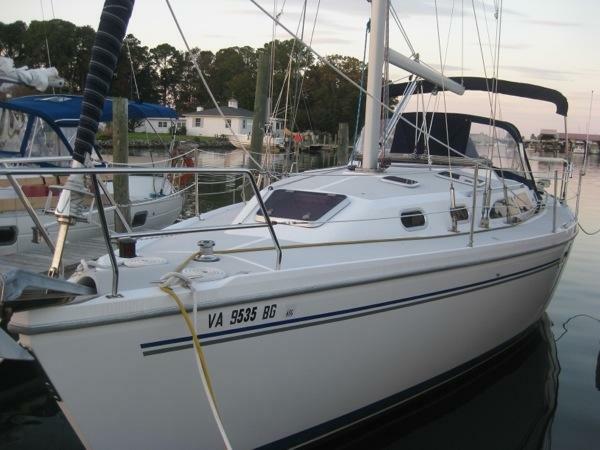 The interior was very roomy and the layout seemed very workable for living and sailing. Aunt Margaret and Uncle Barry enjoy sailing when the wind is just right. They can come to the marina head out into the bay very easily and head back home for the night. Now that’s how to cruise! After our boat tours we went to Cocomo’s for dinner. A charming, waterfront restaurant with lighted, fake palm trees along the walkway. I pointed out the floating trailers and Uncle Barry directed me toward the docks that were lined with these little homes. They looked like pontoon boats with a double-wide set on top. They had little porches extending over the water. Mostly used for vacationers, he explained they are roomy and have a loft above for sleeping. Many have added outboards to be deemed boats and avoid property taxes. Clever! We enjoyed a tasty crab cake dinner. We learned a lot about Aunt Margaret’s and Uncle Barry’s sailing adventures when they would cruise with Brian’s cousins, Maggie & Katie. We laughed about some hairy situations that eventually turned out well. I learned that Margaret is not a fan of wetness inside boats, one of my own pet peeves. We’ve both filled our cabins with hanging sheets, blankets, and foul weather gear trying to dry out. We reminisced about Cuttyhunk Island, a location that Aunt Margaret and Uncle Barry frequented. Thanks so much for a great evening!